 Focused on the welfare of your pets, Catscape provides safe outdoor access with attractive, custom designed enclosures. A division of Beautiful World Living Environments, we design and build to the exact size and configuration you need. If you are ready to get started, contact us to schedule a consultation. Our catios can be freestanding or installed next to a wall or fence. We often connect our enclosures to homes via a pet door or other customized access point. Products can also be designed for use on decks and even inside your home. Within the enclosure we can create steps, furniture and different elevations for your animal to enjoy. At Catscape, we take pride in exceeding your expectations with unique creations and honest, personable service. We enjoy building long-term friendships with our clients. When Will My Enclosure Be Ready? The amount of time it takes for your new enclosure to be built, delivered and assembled depends on a variety of factors including design time and local weather conditions. Every custom pet environment is custom-designed and hand-built, so construction times vary. Generally, you can have your beautiful new enclosure in as little as two weeks' time. 2”x2” PVC-coated wire mesh– Galvanized after welding, this wire mesh has a black PVC bonded surface that makes it virtually indestructible in the environment. PVC-bonded hardware cloth– Light gauge, this galvanized and PVC-bonded wire mesh has 1/4” x 1/4” square openings. PVC-bonded poultry netting– Chicken wire as it is commonly known, the PVC coating on this wire greatly improves its strength and durability. It is soft to the touch and relatively corrosion-free.